We’ve compiled this list of our most popular, most controversial and essentially best ever published articles. There are instances of foreigners suffering violence in Thailand, but you shouldn’t be scared of it, argues James Newman – there are some basic ways to keep yourself safe. David Rosenfield addresses some of the misconceptions people back home have about the Land of Smiles. Love is intertwined with pride in Thailand, argues Frances Suselo — sometimes with tragic consequences. Kelly Iverson argues that the key to reducing the soi dog population is human compassion, not mass murder. Steph Johnson explores the negative perceptions of western women in the Land of Smiles by a choice few of their male counterparts. Derek Hopper examines why western tourists and expats deride Bangkok’s opulent malls so much. Chris Wotton argues that Thailand’s dual pricing policy is outdated and prejudiced. Let’s face it; they’re probably wearing elephant pants. Should long-term expats be made to learn Thai? David Rosenfield looks at the arguments. Teaching English in Thailand: Is the No-Fail Policy Failing Students? Teacher Kelly Iverson explores the weaknesses in the Thai education system, and how that will fail both students and the country at large. The calibre of character in some of Thailand’s expats is sorely lacking. Kevin Cummings explores the meanings behind the world’s most famous smiles. 50 shades of Bangkok expats. Chris Wotton proposes a solution for the motorbikes on the pavement epidemic. What do the creepy Luuk Thep dolls say about the state of Thailand and its people? 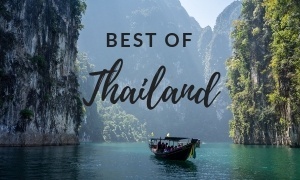 This is the ultimate Thailand bucket list and we’re pretty sure the most comprehensive one on the internet right now. How many have you ticked off? The weather in Thailand isn’t simply rainy season and dry season — there’s a whole lot of weather systems in between. Here’s when the best times to visit Thailand – in terms of weather, prices and festivals. 55 of Thailand’s most exquisite islands. The popular Thai lottery can be confusing to outsiders – we break down exactly what you need to know in order to play (and get behind the underground lottery too). Thailand is the perfect country for honeymooning — whether you’re looking for romance, city slicking, beach bumming or heart-pumping adventure. Absolutely everything you need to know about the world’s most deliciously complex cuisine. Times to venture off the tourist trail. Where to go to get your SCUBA on. We shine a light on the lesser known provinces of Thailand that are well worth your time and energy. Tamara Johnston is saving Songkhla’s soi dogs, one pup at a time. A must-read for Thailand n00bs. Thailand gets a lot of weird weather — here’s when it’s been most destructive. A visit upcountry is quite an experience, according to Steve Edwards. We must explore Thailand’s past to better understand its future. Evo Terra explores how his countrymen die on Siamese shores. From the raucous water fights of Songkran to the terror of the Bun Bangfai Rocket Festival and to the sexual imagery of Phi Tha Kon; there’s something happening every month in Thailand. 40 of the biggest, best and easy to use online shopping portals. A comprehensive guide to Sukhumvit’s most happening soi. The best massages in the Sukhumvit neighbourhood (with not a whiff of funny business). Everything you need to know about kids on Sukhumvit. One of Sukhumvit’s best people watching spots. Getting your gay on in Bangkok isn’t restricted to Silom — Chris Wotton tells us where to enjoy the gay scene in Sukhumvit. 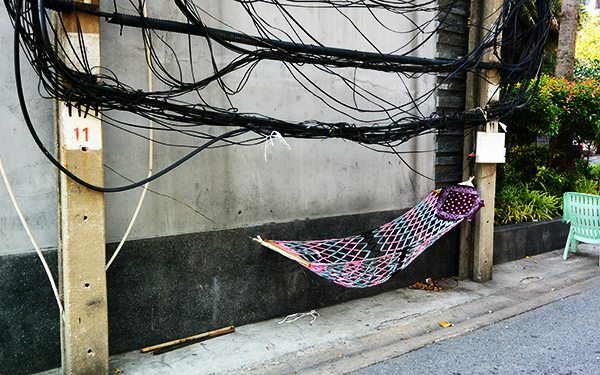 Keeping healthy in Bangkok can be a challenge. If you want to keep healthy or develop a new hobby, we’ve got you covered. 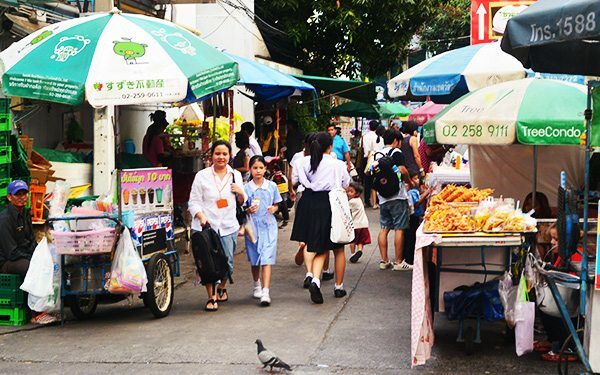 Sukhumvit’s favourite family neighbourhood has a whole lot more going on than just amazing restaurants. Where to get that pie and a pint. Sukhumvit’s oldest nightlife establishment is shutting up shop. Thonglor’s restaurant scene is legendary – here’s the best of the best. Everything a dog-owner and dog lover could ever need to know. From burgers and ribs to Mexican and Italian. City of Angels, the Big Mango — we love you. Does Khao San Road make the cut? The best restaurants to chow down on your favourite international cuisines. Make the most of that monsoon. Think Bangkok is just cheap cheap cheap? Think again. Why are bell peppers so expensive? Thought they were just there to get you from A to B? James Newman reveals all. Scare your girlfriend with a monitor lizard. Want to explore the city without breaking the bank? Here are some of Bangkok’s cheapest good attractions and experiences on offer. Want to make the most of the city this weekend? Let us be your guide. Tracking the changes of Bangkok in photos. Why do Bangkokians walk so slowly? David Rosenfield gives us his opinion on what’s worth your time and money in the City of Angels — and what is best left to the crowds. James Newman argues against the whitewashing of Sukhumvit. All hail Dasa Book Cafe. James Newman examines Bangkok’s favourite ghost. Benny Schup rewrites a more realistic version of the MRT map. Driving in Bangkok is a true art. Frances Suselo interviews a secretive and successful collector of amulets. Do you want to discover all the hidden and local parts of this city? Here are the best and least expensive tours that can help you discover more. You ain’t living until you’ve survived a Bangkok bus ride. Could you survive on 100 baht a day? Steve Edwards did; and lived to tell the tale. 18 ways to make a difference. The best neighbourhoods for tourists and expats. Get off the tourist trail and experience the best of BKK.